Applications: These wheels have diamond bonded to the exterior and will thus slit a wide range of materials including steel, cast iron, brass, bronze, GRP, fibreglass and stone. They offer a longer lasting alternative to standard 3" slitting discs, typically outlasting 40-50 standard discs. 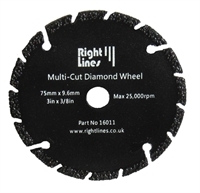 An important benefit is that the diameter does not rapidly shrink as happens with slitting discs. They would normally be used with a die-grinder. We can supply an arbor to fit. This has a 6mm spindle to fit standard collets or chucks. Product Notes: Diamond is securely bonded to the exterior by vacuum brazing. Speed rating: 25,000rpm. Centre bore is standard imperial 3/8" (9.6mm).